Clarence Clyde Seedorf (Dutch pronunciation: [ˈklɛrəns ˈseːdɔrf] ( listen); born 1 April 1976) is a Dutch professional football coach and former player. He is currently the manager of the Cameroon national team. Born in Paramaribo, Suriname, Seedorf was raised in Almere, Flevoland, where he moved when he was two years old. Growing up in a footballing family, with both his younger brothers Jürgen and Chedric Seedorf, and his father former player and talent agent Johann Seedorf, Clarence began his career at the age of six in the youth ranks of his local amateur sides VV AS '80 and Real Almere, before being discovered and recruited to the ranks of nearby Dutch giants Ajax by Urgent Scoutingteam, the talent agency set up by Johan Cruyff, and which was responsible for recruiting the likes of Frank and Ronald de Boer, Edgar Davids, Robert Witschge and Patrick Kluivert to the club as well. 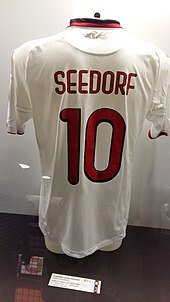 Following in their brother's footsteps, under the guidance of their father and talent agent, Seedorf's siblings, as well as cousin Stefano, would later also join the ranks of Ajax. He is also a pundit on BBC. As a product of the famed Ajax Youth Academy, Seedorf started his career as a right midfielder for Ajax during the early 1990s. He made his professional debut on 29 November 1992 against Groningen at the age of 16 years and 242 days, making him the youngest-ever debutant for Ajax, at the time. He quickly established himself as the first choice on his position under manager Louis van Gaal, and in the 1993–94 season, his second with the club, he helped the Amsterdam-based side win the treble, securing the Eredivisie title, the KNVB Cup and the Dutch Super Cup in the same year. Among his teammates was none other than Frank Rijkaard, the player he used to idolise in his younger days. The following season saw Seedorf help his side secure consecutive Super Cup and Eredivisie titles, as well as help his side to their fourth European Cup trophy, winning the 1994–95 UEFA Champions League after defeating Milan in the final. He played a key role in the final before being replaced in the 53rd minute by striker Nwankwo Kanu. Patrick Kluivert scored a late goal to lift Ajax to a 1–0 victory over the Italian giants, who Seedorf would later go on to represent for a decade. While at Ajax, he was part of a trio known as "De kabel", composed of Edgar Davids, Patrick Kluivert and himself. Later, Winston Bogarde and Michael Reiziger would be added to the group to make it a quintet; what had started as a friendship was then taken over during the UEFA Euro 1996 to describe the group. Opting not to extend his contract with Ajax following their European success and the Bosman ruling, Seedorf signed a one-year contract with Italian Serie A side Sampdoria instead. While not able to obtain any silverware in his first season at his new club, Seedorf appeared in 32 matches, scoring three goals helping his side to an eighth-place finish in the league table, all the while maintaining the form he had demonstrated at Ajax in the past. Seedorf was then able to secure a transfer to Real Madrid, moving to the Spanish La Liga by the end of the season. Seedorf moved to Real Madrid in 1996, where he was virtually ever present for Los Blancos in his first three seasons. In his first season, he helped the team regain the La Liga title, while in his second season, 1997–98, he played a major role in the team's Champions League success, as Madrid secured a 1–0 victory over Juventus in the final, earning his second Champions League title of his career. 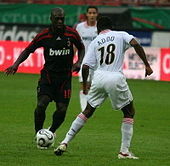 Seedorf playing against former club Real Madrid. On the left is Mesut Özil. While playing for Real Madrid, Seedorf scored a notable long-range goal against Atlético Madrid in 1997. At the end of the 1998–99 season, Madrid and Juventus wanted to swap Seedorf for Zinedine Zidane, but the deal did not go through and the French playmaker waited two more years before joining Real Madrid. Starting from the summer of 1999, Seedorf's role at Real Madrid became less prominent during the tenue of Dutch manager Guus Hiddink at the club. He was eventually transferred back to Italy during the 1999–2000 season, this time to Inter Milan, for a fee about 44 billion Italian lira (approximately €23 million). On 24 December 1999, Seedorf moved to Inter in a $24.35 million deal after cementing his place in the Real Madrid midfield for over three years. Despite helping the team to the Coppa Italia final later that season – a 2–1 aggregate loss to Lazio where Seedorf scored Inter's only goal – Seedorf could not help bring any major silverware to the club. Nonetheless, he is remembered by many Inter fans for his two goals against Juventus in a 2–2 draw on 9 March 2002, both of which were superb long-range efforts. Seedorf with Milan in a friendly against Arsenal. After two years with Inter, Seedorf moved to their city rivals Milan in 2002 in an exchange with Francesco Coco. Seedorf won the Coppa Italia with Milan in 2003, the first time they had won the competition in 26 years. In the same season, Seedorf gained his third Champions League medal, becoming the first player to win the Champions League with three clubs. The all-Italian final saw Milan beat Juventus on penalties after a 0–0 draw, despite Seedorf failing to convert his own penalty. The following season, 2003–04, Seedorf played a role in the Milan side that won the Serie A title. It was Seedorf's fourth national league title of his career, following his two Dutch title wins with Ajax and his one Spanish win with Real Madrid. Seedorf played a major role as Milan reached the Champions League final again in 2005, scoring the only goal of the game in their opening group match against Shakhtar Donetsk on 14 September 2004 and appearing in all 13 competition matches. He started the match, played in Istanbul, against Liverpool in which Milan contrived to lose a 3–0 lead, eventually losing on penalties after a 3–3 draw; Seedorf did not take a spot-kick. Milan also finished runners-up in the Serie A, seven points behind champions Juventus, although Juventus were stripped of the title and Milan docked points for match-fixing. A match-fixing scandal tarnished Serie A and Milan were weakened by the scandal but were allowed to continue in Europe the following season, which led to their top players remaining with the club. Seedorf's role as foil to midfielder Kaká became increasingly impressive as the pair combined in style to score and supply the goals which drove Milan past Bayern Munich and Manchester United to another Champions League final, again against Liverpool. This time, however, they defeated them 2–1 in Athens, with Seedorf collecting his fourth Champions League medal. In that same year, Seedorf was a part of a Milan squad which won the FIFA Club World Cup, becoming the first European player to win the trophy with three clubs (Ajax in 1995 and Real Madrid in 1998). He ended up winning the Silver Ball for the competition. Clarence Seedorf in action for Milan against Eric Addo of PSV in a friendly game on 3 August 2007 at the Lokomotiv Stadium, Moscow. At the end of the 2006–07 season, Seedorf was voted best midfielder of the Champions League. He played his 100th game in the Champions League on 4 December against Celtic. With Milan, Seedorf formed a formidable midfield partnership with Gennaro Gattuso and Andrea Pirlo, which began since the 2002–03 season. This midfield trio was still used in the starting line-up until the 2011–12 season (Pirlo left the Rossoneri in the summer of 2011), although their form had been declining. Under the guidance of coach Carlo Ancelotti, their role was to support an attacking midfielder, whether it be Rivaldo, Rui Costa, Kaká or Ronaldinho. Seedorf became the foreigner with the most appearances for Milan following a game against his former club, Sampdoria, which he scored in. At 395 appearances, he passed Nils Liedholm for this historic milestone. During the Sampdoria game, he also became the ninth-highest scoring foreigner for Milan, with 58 goals. On 29 March 2010, Seedorf was the target of racist chants from Lazio fans in a 1–1 draw, which led to the Rome-based club being given a €15,000 fine by the Italian Football Federation (FIGC). This led the Italy's players' union want racism stamped out in Serie A.
Seedorf won his second Scudetto with Milan in the 2010–11 Serie A season, where he once again played a vital role. He scored four goals and made 36 appearances in the 2010–11 season. Seedorf added yet another medal to his trophy cabinet in the first official game of the 2011–12 season, where he played the full 90 minutes in a 2–1 comeback win over rivals Inter Milan in the Supercoppa Italiana. He scored the winning goal of Milan's first win of the 2011–12 Serie A campaign, a 1–0 defeat of Cesena on 24 September. Seedorf was ranked seventh of the 20 best players of the Champions League, a list which was compiled in 2012 to commemorate the 20th anniversary of the competition. The ranking was done by Champions, the official magazine of UEFA. On 14 May, he said that he was playing his last match with Milan against Novara that day. He also confirmed that he would continue to play football for another club. On 21 June, Seedorf held a press conference announcing his departure from Milan, stating, "I am leaving after 10 wonderful years... I leave a family" after playing for the Rossoneri for a decade and winning two Champions League, two Scudettos and a Coppa Italia. Club CEO Adriano Galliani spoke of Seedorf following the player's departure in the highest regard, stating, "When Milan played well, which happened often, each and every time it occurred Seedorf played an amazing match. He is a world class player." On 30 June 2012, Seedorf signed a two-year contract with Brazilian club Botafogo. The veteran midfielder made his debut with the club on 22 July against Grêmio. On 5 August, Seedorf scored his first goal for Botafogo, curling in a free kick against Atlético Goianiense. On 5 September, Seedorf scored two goals and made an assist against Cruzeiro, helping Botafogo to a 3–1 victory. On 3 February 2013, for the first time on his career, Seedorf scored a hat-trick against Macaé, his first game as a starter that year. Before that game, Seedorf played the second half against Fluminense and made a good assist to Bolívar, who scored the match's equalizer. On 10 March 2013, Seedorf won his first title with Botafogo: the 2013 Taça Guanabara, the first round of 2013 Campeonato Carioca. On 5 May, he won the second round of 2013 Campeonato Carioca – 2013 Taça Rio – against Fluminense. That is also the day of his first official title for Botafogo, the 2013 Campeonato Carioca, as the team won both rounds and no final match was needed. On 6 June, Seedorf scored his 100th goal in domestic league play: 11 with Ajax, 3 with Sampdoria, 15 with Real Madrid, 8 with Inter, 47 with Milan and 16 with Botafogo. On 14 January 2014, Seedorf announced his retirement from professional football. He announced that he is ending his playing career to take up the manager position at Milan following the sacking of Massimiliano Allegri. Due to Surinamese rules against dual citizenship, players who take Dutch citizenship are no longer eligible to represent the Netherlands' former colony. He received his first callup on 14 December 1994 at the age of 18 against Luxembourg. Seedorf scored on his debut, helping his team to a 5–0 victory in a UEFA Euro 1996 qualifying match. Seedorf was in the Dutch squad for the UEFA European Championships in 1996, where his penalty miss proved decisive in the quarter-final shootout defeat to France. He also appeared for the Netherlands at Euro 2000 and 2004, as well as the 1998 FIFA World Cup, reaching the semi-finals in all three of these tournaments. On 12 November 2006, Seedorf was recalled for the first time since June 2004 as a replacement for the injured Wesley Sneijder. He started and played the full 90 minutes in a 1–1 friendly draw against England. Seedorf won the last of his 87 caps for the Netherlands in 2008. In the Euro 2008 qualifiers against Romania (0–0 at home) and Slovenia (1–0 away win), Seedorf played four and six minutes respectively. There were doubts on his position within the national team, as Marco van Basten favoured younger players such as Rafael van der Vaart, Wesley Sneijder and Robin van Persie. On 13 May 2008, Seedorf announced that he would not take part in UEFA Euro 2008 due to his ongoing personal conflict with Van Basten. Seedorf was a well-rounded, hardworking and versatile player, who was gifted with strength, pace, stamina and notable physical attributes, which allowed him to play anywhere in midfield and contribute both offensively and defensively, due to his significant tactical intelligence; although he primarily served as a playmaker in the centre, throughout his career he was also deployed as an attacking midfielder, on the wing, or in a holding or box-to-box role. A world class midfielder, in addition to his fitness and athletic characteristics, as well as his ability to break down opposing plays and win back possession, he was an elegant, creative player and an excellent dribbler, possessing outstanding technique, ball skills and vision, which enabled him to retain possession when under pressure and subsequently lay the ball off to an on-rushing teammate; he was also an accurate passer and crosser of the ball. Seedorf was also capable of scoring goals due to his powerful, accurate striking ability from distance with either foot; furthermore, he was an effective free kick taker. Despite his physical, energetic, and tenacious style of play, Seedorf was regarded as a correct player, and was sent off only two times in his entire career. In addition to his success and footballing skills, Seedorf has also been praised for his longevity as a footballer. Seedorf was appointed the new head coach of Milan on 16 January 2014, terminating his contract with Botafogo early in order to take on the managerial role, with Milan languishing in 11th in the Serie A table. On 19 January, he won his first managerial match, played against Hellas Verona, with Mario Balotelli scoring the lone goal of the game. Despite overseeing the club's first five-match winning run since 2011, and first Serie A victory in the Milan derby against Inter since 2011, Seedorf was dismissed by Milan on 9 June 2014 after just four months on the job, with Filippo Inzaghi being named as his successor. During the Dutchman's time at the helm of the club, Milan gained a total of 35 out of a possible 57 points - the fourth-most out of all Serie A sides (one less than Napoli's corresponding total and six less than Roma's). Seedorf was appointed manager of China League One team Shenzhen F.C. in July 2016, but was replaced five months later by Sven-Göran Eriksson. A year later Seedorf joined Brazilian club Atlético Paranaense as both a coach and a sporting director Within a month the deal was cancelled after both parties failed to reach an agreement. In February 2018, Seedorf was appointed as manager of Spanish club Deportivo de La Coruña for the remainder of the 2017–18 season. Seedorf led the team to just two wins in sixteen matches, Deportivo were relegated from La Liga, and at the end of the season he left the club. After a deal with Sven-Göran Eriksson could not be agreed, the Fédération Camerounaise de Football appointed Seedorf as the manager of the Cameroon national team in August 2018. He was joined by former teammate Patrick Kluivert as his assistant manager. Seedorf with Queen Máxima and King Willem-Alexander of the Netherlands. Seedorf speaks six languages fluently: Dutch, English, Italian, Portuguese, Spanish and Sranan Tongo. He was often seen as a spiritual, intelligent and articulate figure in football, and in a 2011 interview, Seedorf stated that he was studying to obtain a master's degree in Business at the prestigious Bocconi University in Milan; because of this, he earned the nickname "il professore" ("the professor") during his time playing at Milan. Seedorf is married to a Brazilian woman, Luviana Seedorf, with whom he owns a restaurant called Finger's in Milan. They have four children. Seedorf has dabbled in media-related work during recent years. In 2009, he worked with The New York Times to run a column entitled "Seedorf responds", where once a month he would answer peoples' questions regarding football. He joined the BBC's team covering the 2010 FIFA World Cup in South Africa, working as a television pundit He also presented a number of features for the BBC coverage, including one about Robben Island. He joined the BBC for their Match of the Day Live coverage of UEFA Euro 2012. He has also made appearances on Match of the Day 2 during the English football league season. Because of his strong connection with the country Suriname, where he was born, he is involved in many social development projects there. He built his own "Clarence Seedorf Stadium" in the district of Para in Suriname. In this stadium, the Para Juniors League of Suriname is being held and the teams of the Suri Profs & SV The Brothers play there regularly. With his Champions for Children Foundation, he supports projects for good causes in Suriname. For this, Suriname has honoured him to Commandor of the High-Order of the Yellow Star, and recently in 2011, he was invested as a Knight of the Order of Orange-Nassau (OON). On 5 June 2009, Seedorf announced at a press conference after a meeting with Nelson Mandela that he had become the Nelson Mandela Foundation's latest Legacy Champion. He joins Patrice Motsepe, Tokyo Sexwale, David Rockefeller, Peggy Dulany and Bill Clinton, who are also members of a select group of philanthropists who are helping to ensure that Mr. Mandela's legacy lives on. In 2012 and 2014, Seedorf took part in Soccer Aid, a charity match at Old Trafford with former professional players and celebrities. He played for "The Rest of the World" team against England. In 2014, he scored a hat-trick, where The Rest of the World won 4–2; they raised over £4 million in total. Clarence's nephew, Collin Seedorf, is also a professional footballer, and currently plays for Dutch club, FC Eindhoven. Statistics accurate as of last match played on 8 December 2013. ^ a b "Clarence Seedorf – A.C. Milan squad 2011/2012". A.C. Milan. Archived from the original on 27 January 2012. Retrieved 26 January 2012. ^ Although the page does not exist anymore, his height was listed as 177 for his last A.C. Milan season. ^ "Clarence Seedorf". Voetbalcanon.nl – de Nederlandse voetbalhistorie in 22 vensters. ^ Vissers, Willem. "Een hele eer voor Seedorf: een eigen plein in Almere". Volkskrant. Retrieved 3 December 2013. ^ "AC Milan sends Seedorf Jr. to France". Tribalfootball. Retrieved 3 December 2013. ^ "Clarence Seedorf profile". Inter Milano. Archived from the original on 18 January 2014. Retrieved 3 December 2013. ^ "The evolution of Barcelona's DNA from Ajax". ESPN. Retrieved 3 December 2013. ^ "Clarence Seedorf biography". Monsters and Critics. Archived from the original on 17 January 2014. Retrieved 3 December 2013. ^ "Wijnaldum jongste Feyenoord-debutant" (in Dutch). NOS.nl. Archived from the original on 30 September 2007. Retrieved 13 August 2007. ^ "AFC Ajax " season 1993/1994". Worldfootball.net. Retrieved 3 December 2013. ^ "Ajax's adolescents master men of Milan". ESPN. Retrieved 3 December 2013. ^ UEFA Champions League – Matches – UEFA.com Archived 12 April 2012 at the Wayback Machine. 2000.uefa.com. Retrieved on 22 June 2013. ^ Seedorf confirms AC ola Milan exit –. Goal.com (21 June 2012). Retrieved on 22 June 2013. ^ a b c d Paul Madden (1 April 2010). "Spanish Cumpleanos: Javier Irureta". Goal.com. Retrieved 27 April 2010. ^ Seedorf confirma saída do Milan e deixa futuro em aberto – Esporte – Notícia – VEJA.com. Veja.abril.com.br (21 June 2012). Retrieved on 22 June 2013. ^ SEEDORF – against atletico madrid 1997. 30 August 2011. Retrieved 16 February 2012. ^ "Oriali a Madrid per Seedorf Ed e' nata l' idea Benarrivo". La Gazzetta dello Sport (in Italian). 9 August 1999. Retrieved 27 January 2010. ^ CNN/SI – World Soccer – Inter Milan signs midfielder Seedorf – Friday December 24, 1999 11:56 AM. Sportsillustrated.cnn.com (24 December 1999). Retrieved on 22 June 2013. ^ RaiSport – 12 Aprile 2000 – Speciale Coppe: Lazio-Inter 2–1. .raisport.rai.it. Retrieved on 22 June 2013. ^ "Agreement reached between inter and ac milan for seedorf-coco swap". inter.it. 30 May 2002. Retrieved 26 January 2010. ^ "AIC bid to kick out racism". Sky Sports. 29 March 2010. Retrieved 18 February 2012. ^ Supercoppa Italiana 2011: MILAN-INTER 2–1. legaseriea.it (6 August 2011). ^ Seedorf Leaves Milan –. Legaseriea.it (21 June 2012). Retrieved on 22 June 2013. ^ "Seedorf signs with Botafogo". FIFA. 1 July 2012. ^ "Botafogo lose to Gremio in Clarence Seedorf's official debut". Live Soccer TV. 22 July 2012. ^ "Netherlands 5 – 0 Luxembourg". UEFA. 14 December 1994. ^ "France reach last four after shoot-out success". UEFA. 6 October 2003. ^ "Seedorf Blames Van Basten For Exit". Goal. 14 May 2008. ^ a b c d e Michael Cox (10 March 2014). "Unlike Simeone's Atletico, Seedorf's AC Milan still searching for identity". ESPN FC. Retrieved 26 July 2016. ^ a b c d "Seedorf reaches Milan landmark". fifa.com. FIFA. 13 May 2012. Retrieved 23 April 2015. ^ a b c "AC Milan Hall of Fame: Clarence Seedorf". A.C. Milan. Retrieved 11 September 2014. ^ "Zenga su Seedorf: "Ha tutte le caratteristiche per fare bene"". milannews.it (in Italian). Archived from the original on 12 September 2014. Retrieved 11 September 2014. ^ "Samples with the Rossoneri: Clarence Seedorf". advarsitysports.com. 14 October 2014. Retrieved 23 April 2015. ^ "Clarence Clyde SEEDORF (I)". magliarossonera.it (in Italian). Retrieved 23 April 2015. ^ "Euro 2000 Profile: Clarence Seedorf". BBC Sport. Retrieved 11 September 2014. ^ "Clarence Seedorf" (in Italian). Treccani. Retrieved 11 September 2014. ^ "Pirlo: 'My free-kick secrets'". Football Italia. 28 November 2017. Retrieved 17 December 2017. ^ "Milan 1-0 Verona". BBC Sport. 19 January 2014. Retrieved 5 July 2018. ^ a b "AC Milan sacks manager Clarence Seedorf and replaces him with youth-team coach Filippo Inzaghi". Milan, Italy: Fox News. Associated Press. 9 June 2014. Retrieved 9 June 2014. ^ "Former AC Milan coach Clarence Seedorf takes over at Shenzhen FC". South China Morning Post. Retrieved 10 July 2016. ^ "深圳官方宣布埃里克森挂帅西多夫离任 重塑深足". Sina. Retrieved 5 December 2016. ^ "Brasileirao, Seedorf torna in panchina: allenerà l'Atletico Paranaense". Il Corriere dello Sport (in Italian). 21 December 2017. Retrieved 21 December 2017. ^ "Seedorf set for Brazil return?". Football Italia. 21 December 2017. Retrieved 21 December 2017. ^ "Seedorf acerta com o Atlético-PR para cargo inédito de manager". Globo Esporte (in Portuguese). 21 December 2017. Retrieved 21 December 2017. ^ "Clarence Seedorf, nuevo entrenador del Real Club Deportivo" [Clarence Seedorf, new coach of Real Club Deportivo] (in Spanish). R.C. Deportivo de La Coruña. 5 February 2018. Retrieved 5 February 2018. ^ "Seedorf no seguirá al frente del Deportivo" [Seedorf will not continue to lead Deportivo]. Mundo Deportivo (in Spanish). 22 May 2018. Retrieved 22 May 2018. ^ a b "Cameroon appoint Seedorf & Kluivert as deal for Eriksson falls through". BBC Sport. 4 August 2018. Retrieved 11 October 2018. ^ "Soccer Training Info – Soccer Players Speaking Foreign Languages". ^ "Nothing found for 2014 01 18 The Most Interesting Man In The World Clarence Seedorf". Archived from the original on 12 January 2015. ^ FIFA.com (13 May 2012). "Seedorf reaches Milan landmark". ^ "Seedorf, campione anche nel business". Retrieved 15 September 2014. ^ ABDOMEDIAGROUP (9 March 2011). "Kate Giles Interviews Clarence Seedorf on CNN" – via YouTube. ^ "Big interview Clarence Seedorf paints picture of hunger and intelligence". Retrieved 15 September 2014. ^ "Clarence Seedorf: One-on-One". Retrieved 15 September 2014. ^ "La moglie di Seedorf fa belli i calciatori". Archived from the original on 10 April 2011. Retrieved 15 September 2014. ^ "Seedorf editorialista del NY Times". Retrieved 15 September 2014. ^ "Klinsmann and Seedorf join BBC's World Cup team". BBC Sport. 22 April 2010. Retrieved 9 March 2011. ^ "World Cup 2010: Clarence Seedorf goes to Robben Island". BBC Sport. 7 July 2010. Retrieved 9 March 2011. ^ "Seedorf – Off the field – Champions for Children". Retrieved 15 September 2014. ^ Wright, David (8 June 2014). "Result: Clarence Seedorf scores hat-trick for Rest of World in Soccer Aid". Sportsmole. Retrieved 9 June 2014. ^ Buse, Daniel (8 October 2018). "Twente verschenkt spät noch zwei Punkte". Westfälische Nachrichten (in German). Retrieved 9 October 2018. ^ "Clarence Seedorf – Career Statistics". Worldfootball.net. ^ "Clarence Seedorf". National Football Teams. Benjamin Strack-Zimmerman. ^ Clarence Seedorf – International Appearances. Rsssf.com. Retrieved on 22 June 2013. ^ "Clarence Seedorf – International Appearances". RSSSF. Retrieved 17 August 2012. ^ "CLARENCE SEEDORF RETURNS TO AC MILAN AS A COACH | News | AC Milan". acmilan.com. 25 January 2014. Retrieved 19 January 2014. ^ a b c d "Clarence Seedorf – Career Honours". Soccerway. ^ uefa.com (18 May 2016). "UEFA Europa League – News – UEFA.com". ^ "Clarence Seedorf – Dutch Talent of the Year". RSSSF. ^ "Clarence Seedorf – ESM Team of the Year". RSSSF. Archived from the original on 7 February 2016. ^ "Clarence Seedorf - UEFA Team of the Year 2002". UEFA. ^ "Clarence Seedorf - UEFA Team of the Year 2007". UEFA. ^ "UEFA Champions League Awards". UEFA. ^ "News & Media – FIFPro World Players' Union". ^ "Ryan Giggs vs Clarence Seedorf: Who's the Best Player?". Bleacher Report. ^ "Para Seedorf, seleção do prêmio Bola de Prata venceria a Champions". ESPN.br. ^ "Seedorf koninklijk onderscheiden". NOS. ^ "Il Golden Foot 2018 è Edinson Cavani" (in Italian). www.radiomontecarlo.net. Retrieved 6 December 2018. Wikimedia Commons has media related to Clarence Seedorf.